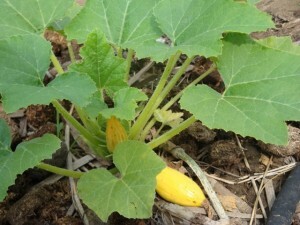 Summer Squash are popular and tasty gourd vegetables that are closely related to cucumbers, melons and pumpkins. From historical evidence, squash appear to be native to the Americas and an important vegetable in primitive agriculture. Squash and pumpkin cultivation date back 9,000 years in Central America and Mexico. Native Americans grew Boston Marrows squash which is the oldest squash still in commercial production. Flowers of both Zucchini and crook-neck are edible and the Zuni tribes of the Southwest used the squash blossoms in soups. Summer squash differs from it’s winter squash cousin by growing on bushes instead of vines (like pumpkins) and summer squash is picked before the rind hardens and the fruit matures.